Selected Writings: WHAT IS THE SOVIET? Of the many terms in which the social and political sciences abound the term "people" is perhaps the vaguest. Indeed, we have no clear-cut image and hence no effective idea of this apparently concrete entity People. Intimately connected with this term, no less vague and still more confusing, is the word ''government,'' a word depicting a reality as concrete and as hard as the age-old rocks themselves. The relation, however, obtaining between these two realities is in one respect clear; inasmuch as all the power of a people is vested in its government, the people is divested of all power - a relation so typically and as it were monumentally expressed in the cry, "L'etat c'est moi," desperately uttered by the head of the French government during the period of its ultimate decay. The Russian Revolution, now occupying the center of the quaking world's stage, allows the careful observer to catch a glimpse of what that entity People really must be. The Russian people, struggling to assert itself, has in the travail of the Revolution given birth to a new creation flexible mobile and yet persistent as are the thought and will it expresses. This creation is, the Soviets. The trumpets of the March revolution, 1917, brought down the Romanov dynasty, and the rejoicing of the Rus­sian people knew no bounds. But the events immediately following had a sobering effect upon the masses. The first burning question arose: "Is the Revolution safe 9" As the embodied answer to this question, sprang up the Soviet, a revolutionary creation, a child of the people's awakening consciousness. City, town and village, as well as each unit of the army, all formed their local Soviets to safeguard the Revolution. These local organs,. always functioning and therefore always reflecting the thoughts, desires and will of the small communities they represent, send delegates to the capital, who form the Central Executive Committee of all the Soviets of Workmen's, Soldiers' and Peasants' Delegates. 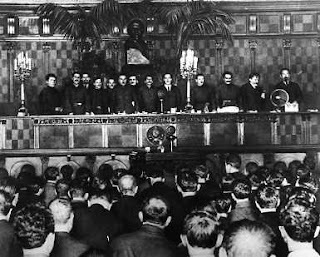 The election to the central body is carried out on the basis of party lines, so that the C. E. K. has always represented all the various currents and even undercurrents of the Russian Revolution. Soon after the overthrow of Tsardom, the people felt that the newly-formed Provisional Government of Lvov­ Rodzianko-Miliukov did not intend to deviate from the general policies of the old regime. This popular feeling imparted itself to the local Soviet s, which resulted in the second question, "Who is friend and who is foe?" In other words, the Soviet was forced to explain the sense of the Revolution. The first answer was a fermentation within the Soviets, reflecting the people's questioning mind, and this fermentation ended in the cleavage of the Soviet forces. Materially the split manifested itself in the first '' coalition government,'' headed by Kerensky. This second question was made more vital, insistent, by the Kornilov attempt. It grew more and more obvious to the people that the '' coalition government'' was merely an expression of the old order under a new name. In response to the growing popular unrest, the rift in the Soviet deepened; whatever elements irresistibly tended to the right were pushed out by popular pressure upon the left and the result was the July insurrection. The Soviet thus emphasized the popular interpretation of the sense of the Revolution: It is not merely a political revolution, but an economico-social revolution, and whoever thwarts its course is the people's enemy. But if indeed this is the historical sense of the Revolution, then arises a third question: By whom and How shall the issues of the Revolution be promoted and realized in life? Of course by the People, and by the power which expresses the People by the Soviets. Such was the categorical answer given by the October uprising, which forever put an end to the policy of coalition and alliances of the real Revolution with the representatives of the dying old order. Thus by a. process of elimination the Soviet was finally purified of elements leaning toward the right; a process which showed, that as the individual hesitates before making his choice and stamping as his will one or the other of the ideas conflicting in his mind, so the Russian people hesitated before it found and expressed its conscious will. And the Soviet made all this possible. (3) Fully matured as the voli-national and intellectual organ of its parent, the people, it became the realizer of the issues of the Revolution. 'l'he superiority of the Soviet over any other form of representation is easily demonstrable. All government pretends to represent the will of the people. Now granted (for the sake of argument), that a people's will is as real as the will of an individual, and that it is the sum or resultant of the sundry wills composing it, it is manifest that no representative body can satisfactorily execute this composite will. As a matter of fact, the will of an individual is not easily satisfied by proxy. So that it may be tersely stated that the efficacy of a representative is inversely proportional to the numeric strength of the constituency represented. Viewed from this angle, it is obvious ·why an order of things that has become detrimental to the people at large can be perpetuated by a ''representative'' government which has degenerated into a tool of the invisible government. 'l'he history of the War is very instructive in this, as in many other respects. It is now clear as day how the invisible power, the class owning and dominating the economic apparatus in all countries, owned also the representative government, and through it tried to perpetuate secret diplomacy, financial speculation, capitalistic exploitation of the masses, all factors inevitably leading to both internal and external wars-and all this in the name of the People. In the first place the Soviet is a local body, of the people and with the people. A member of the Soviet represents no more than about five hundred votes. He can be at any time replaced, he is always in sight- no invisibles allowed. Furthermore the Soviet works ''centripetally' '-the central body is 'controlled by the periphery. In this respect the Soviet government may be compared to a central meteorological bureau, whose usefulness and efficacy, whose very raison d'etre- is determined by the workings of the local weather bureaus. Indeed, history seems to show mankind a new form of State organization which closely approaches the demands of the people, and corresponds with the new order of things ushered in by the Russian Revolution. Constituent Assembly by the power of the Soviets stirred no ripple on the faces of the immense sea of the Russian masses; while the threatened curtailment of the powers of the Soviets, two months ago, destroyed the Provisional Government. Who does not realize how evasive language is ! Present day representative government- the parliament- is so skilled in the handling of language that when the people clamor everywhere for peace, they are "persuaded" that peace can only be achieved by war; when they want a living they are given it at a prohibitive cost, etc., etc. The Soviet, being close to the people, must express realities literally, as the people itself expresses them. The Soviet is probably the most important contribution of the Russian Revolution. No "property" rights unless otherwise noted . We encourage sharing of writings at the Blog. We do not impose on showing blog as the "source" other than that of the original.